As our 2013 Interbike coverage comes to a close, I have to say that there were many people we saw, talked to, and admired. There’s only so much one can write about any one event before you get exhausted. I would like to spend some time now talking about a bunch of brands that I visited and geeked out with. Pioneer made an appearance this year with their SGX-CA900. 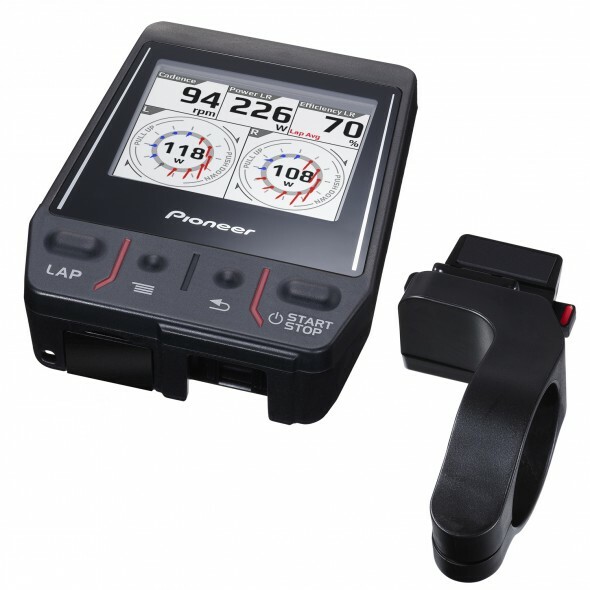 Yes, it is mounted to a road crank, but think about it: What if there was enough demand for this type of computer and stereo power meter combo? The Pioneer can measure in real time the vector forces applied to each pedal. Not only that, but it will also act as a GPS unit, recording altitude and temperature. 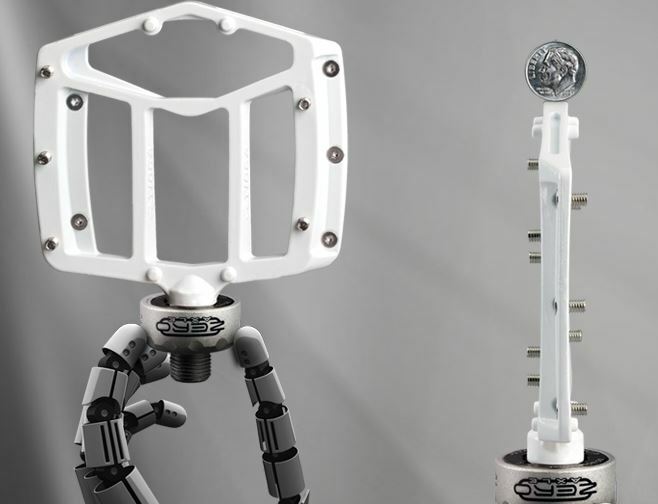 All in all the SGX-CA900 could be used as a training aid, where a coach could go over an entire ride’s force analysis, and use this data to further improve your riding. 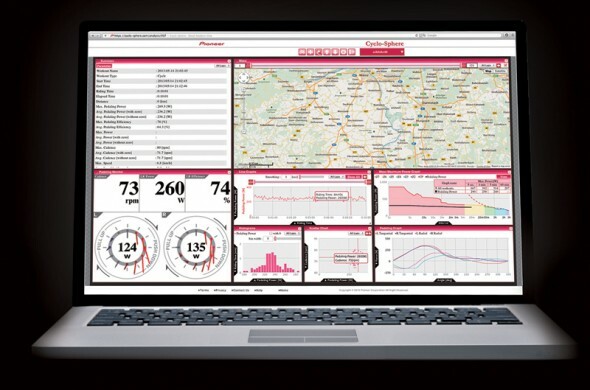 Using a Cycle-Sphere cloud service ,your ride and all its data can be shared world wide. This is pretty cool, if you ask me. Although I’m not racing anymore, a tool such as this could even be used for things like identifying leg performance after an accident (during recovery), because you can identify cadence performance or deterioration. Being ANT+ ,the Pioneer unit can pair up with other ANT+ devices for even more date if you desire. The unit itself records at 24hz, taking into account both radial and tangential forces. The unit uses a 2.2in High Visibility Semi-transparent display (QVGA LCD Color TouchScreen), with a 320 x 240 pixel resolution. Up to 9 metrics can be displayed at one time when riding. Up to 200 different ways are possible to present this data. 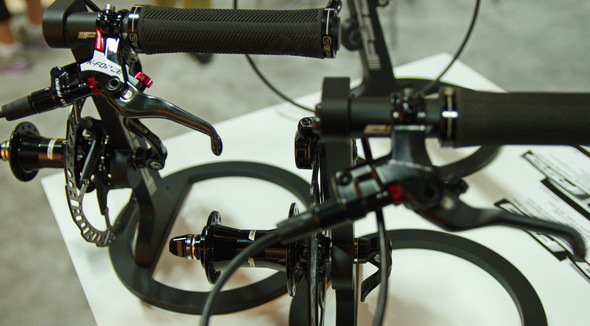 Presently the cost is about $1,600 for the unit, and it can only be installed on Shimano Dura-ace 9000 or 7900 cranks. Designs are in the works for other cranks, however. 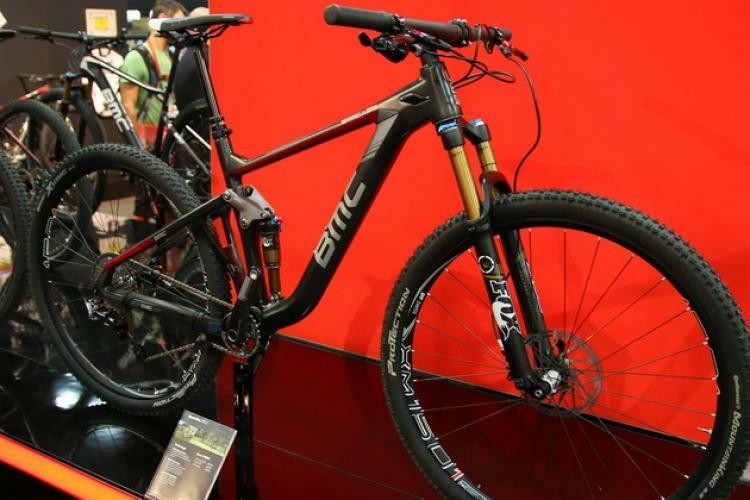 When that day comes, the SGX-CA900 may just find its way onto some XC racers’ bikes. If you do intend to purchase one of these $1,600 tools, just be aware that this is not a toy computer that is just tie wrapped in place, you will need to take your crank in and have it professionally installed as it is a highly sensitive set of strain gauges installed on the crank arms that have to be bonded perfectly in place. Judging by the amount of care that Pioneer put into bringing this product to market, I can only see good things from this in the near future. 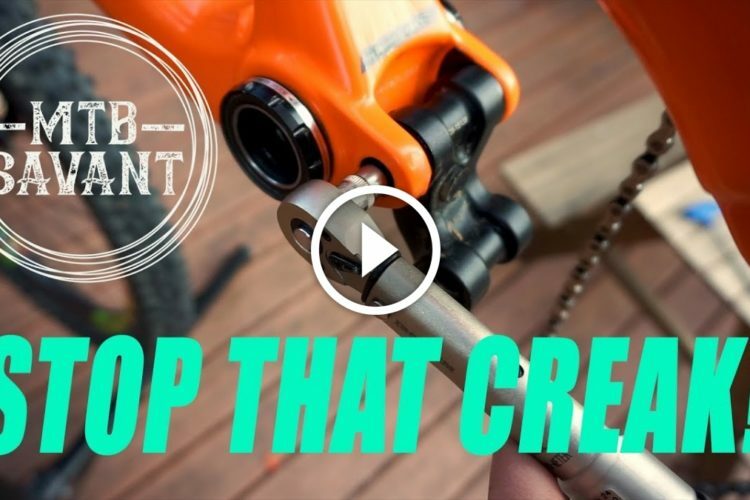 Hopefully sooner rather than later for MTB cranks. I had a great time hanging out with the FSA folks (Joel Ricardson and Herb Tai) going over the new K-FORCE brake. 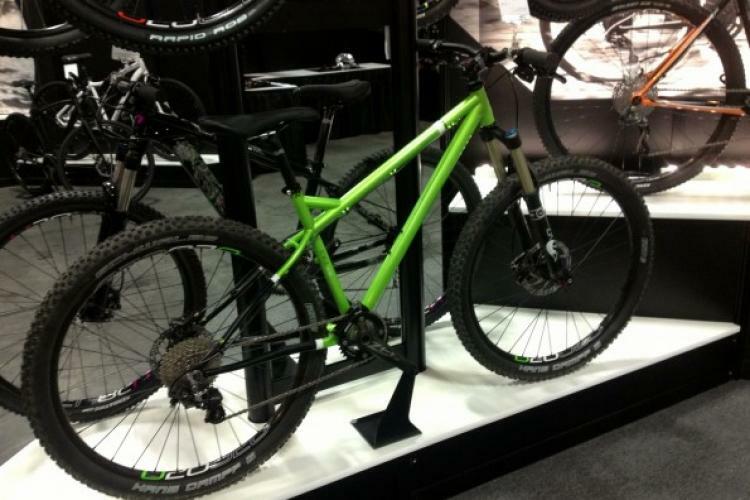 The new K-Force won’t be available until next year, unfortunately, but got its big launch at Eurobike and Interbike! 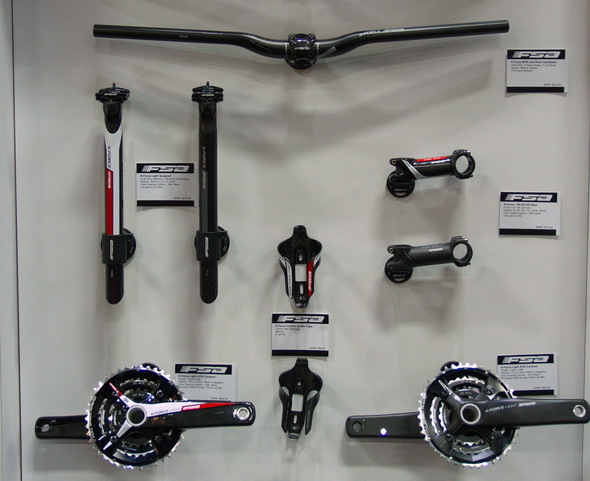 The K-Force is an inline brake. An asymmetrical windsock-like reservoir makes for a compact design, taking up little bar space. 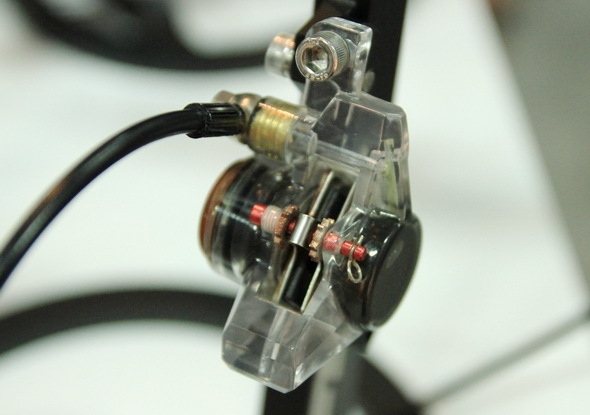 Inside the lever body, the piston is actuated by the lever via a rocker cam, which keeps the mechanical advantage linear for a consistent lever feel. 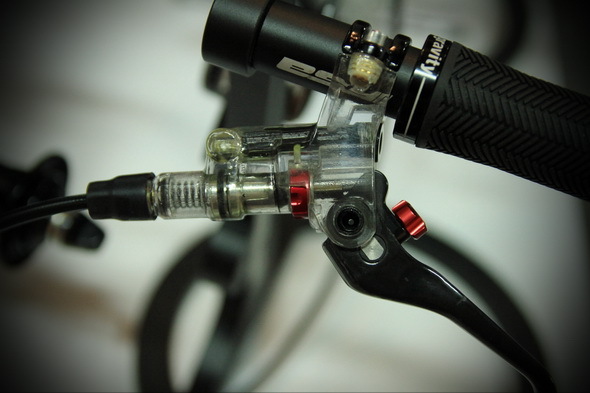 Other cool features with the lever include the integrated tool-free reach adjustments and contact point controls. The good thing about these controls is that they are placed safely away from harm’s reach in the event of a crash. The brake is available in two flavors for now. The XC lever body is constructed out of magnesium. A carbon lever blade with a hollow oversized bushing is used to keep weight down and provide a longer service life. 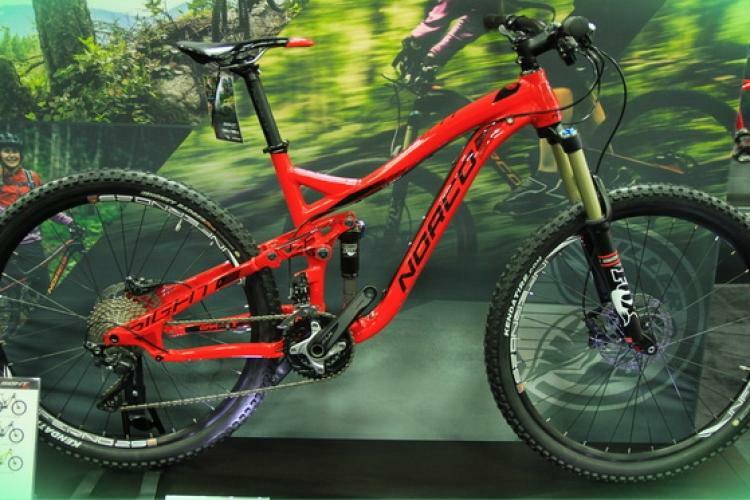 The all-mountain version comes with an alloy body and lever instead. Both brakes will use a forged one piece caliper that will reduce flex and improve feel. With a proven top-loading design and phenolic pistons, this promises to be an easy-to-maintain unit. 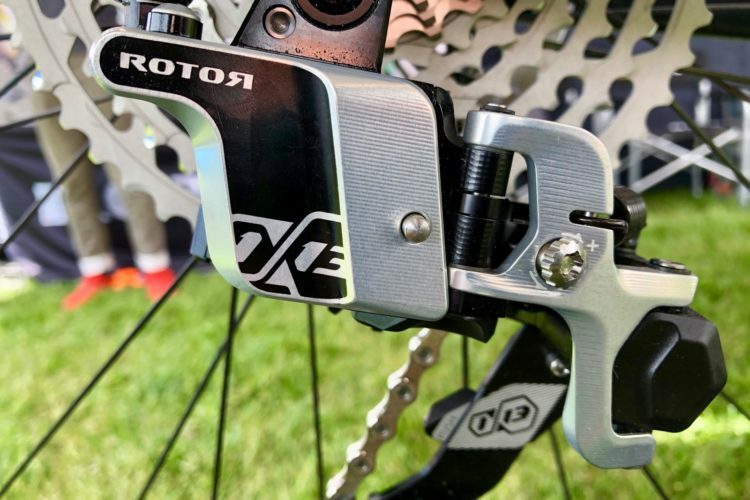 The brakes will come in at about 305 grams for the XC version and 345 grams for the AM version (depending on rotor choice). What most impressed me was the brake-specific hosing. Yeah, you read that correctly: there are front- and rear-specific hoses. That way, both the front and rear brake will reportedly feel the same when put under pressure. Rotor size ranges from 140 to 180mm, with a two-piece option as well. Pads are a proprietary semi-metallic blend. When they do make it to market, and you do purchase these, FSA made their pads in the same shape as another well known brand for ease of pad replacement. The K-Force group was on display at the FSA booth as well. This group is something you may just want to consider if you’re going for that match look with the brakes. The K-Force crank comes in a double or triple, or you could choose the K-Force 386, which further reduces weigh (586 grams or less*). 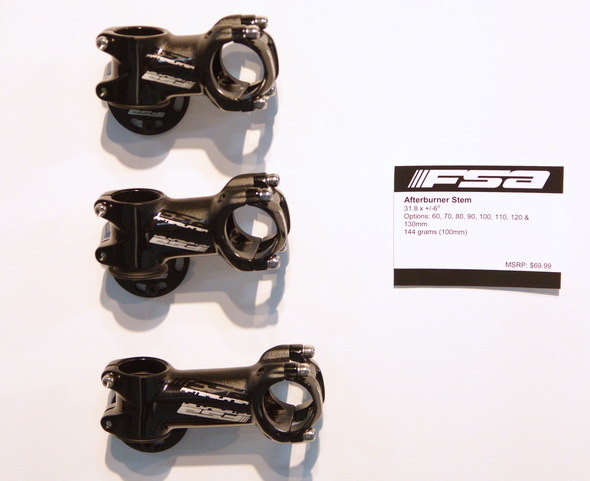 You could go single with an aftermarket or FSA ring if desired for a 1x setup. The K-Force low rise bar is only 700mm wide (I wish it was a bit wider) and comes in at 180grams. It features a UD finish and 8 degree back sweep and 3 degree up sweep. 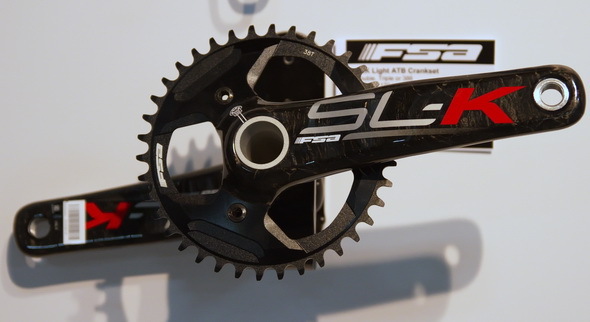 Above is the all-new SL-K crank designed for 1×11’s Although it has been optimized for 11spd, it will work fine with a 10-speed drivetrain. If you look carefully at the ring, the extra depth in the teeth will keep you on track… well, at least your chain on track! 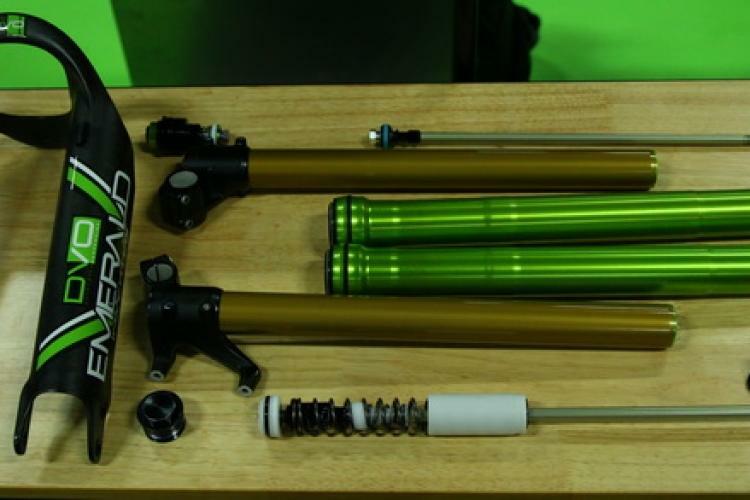 Coming in at 660ish grams, this will be a nice addition to many a bike build. These stems also caught my eye. For one thing, they are not too costly, but provide options if you’re looking to go a bit shorter up front. Tioga was on hand with a few interesting products. 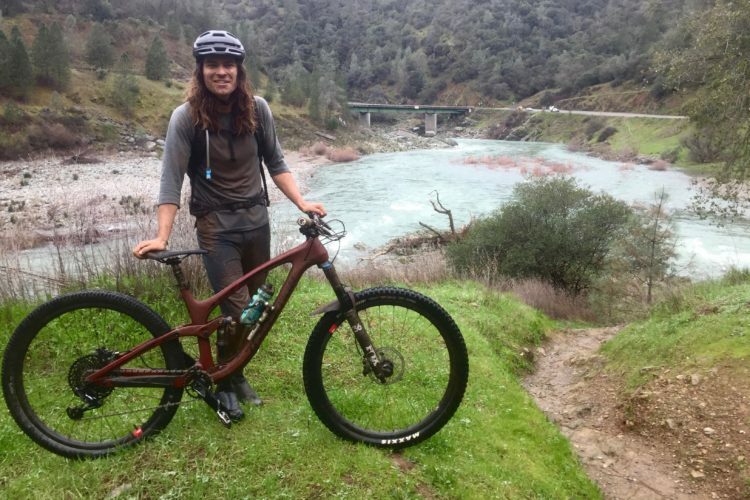 The new Spyder Stratum pictured above comes in at a light 120 grams, which is pretty impressive considering it still feels pretty soft compared to some full-on carbon saddles. 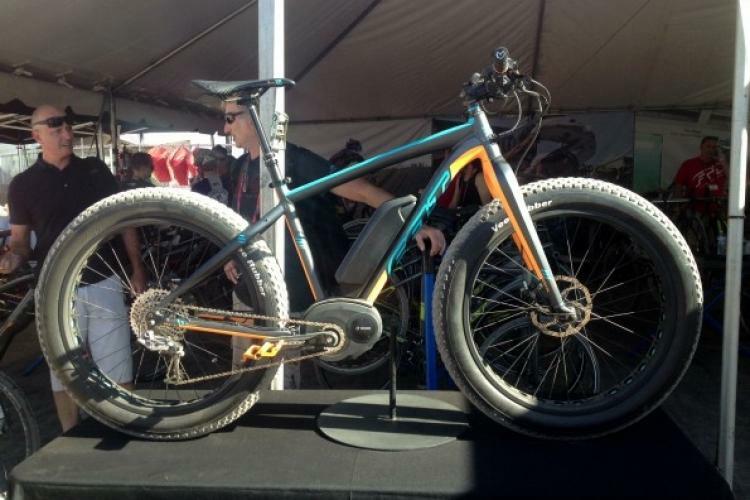 The reduction in weight here comes from the carbon rail system. The covering is made from carbonite, which remains flexible while seated. Are you thin-obsessed? Well, these may be the ticket. The MT-Zero are nearly that: with only an offset of 2mm from center (at its thinnest), these are one of the slimmest pedals on the market. Coming in at 480 grams, the replaceable body is made from CroMo and uses a cartridge bearing system. The big benefit with the MT-Zero is ground clearance. With bottom brackets going lower as we speak, clawing back millimeters anywhere you can is key. Cue MT-Zero.